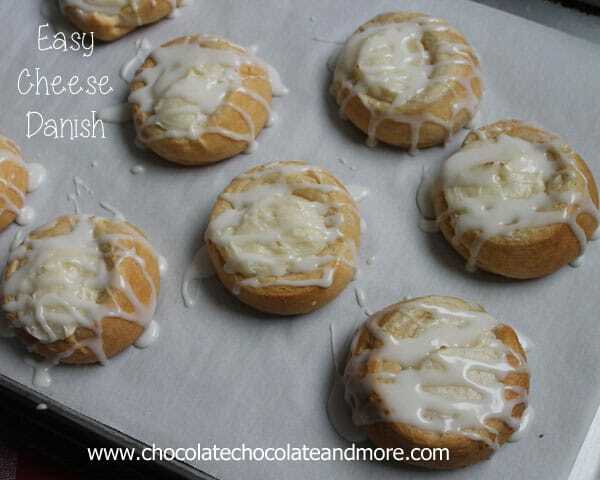 Easy Cheese Danishes - Chocolate Chocolate and More! 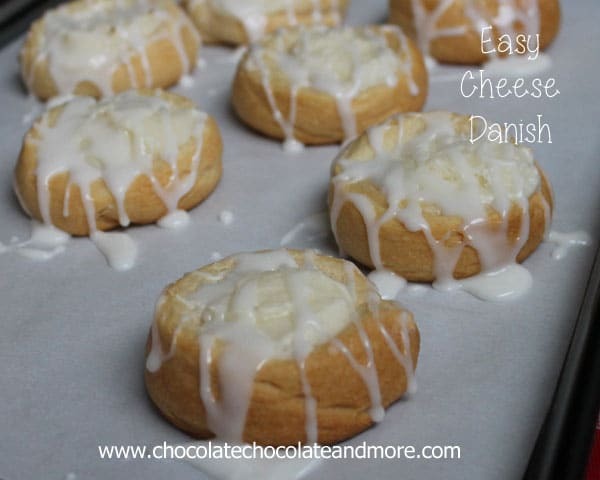 Easy Cheese Danishes-so simple to make and so delicious! I’m sure I’ve mentioned my middle child a few times before. She’s the picky eater. The one that doesn’t want fruit or veggies unless forced. (She has gotten better with age.) But when I made this amazing Braided Raspberry Cheese Danish, she wanted nothing to do with it. She took one look at the red raspberries and walked off. Not wanting her to be completely left out. I decided I needed to make something similar for her. But I didn’t want to make a whole danish. Honestly, I love my sweets but I try to moderate how much I have in the house at one time. And then I had a brain storm. That little lightbulb over my head went off. It was a blinding light. It was so simple. Just make her plain cheese danishes. 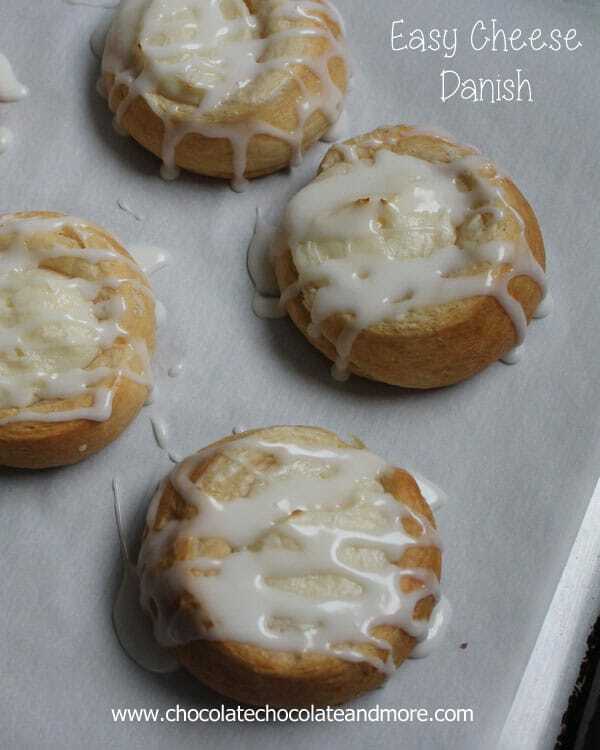 Cute, individual danishes that you could grab and eat. No fancy presentation. No spending extra time preparing everything. These sweet little things took maybe 5 minutes to put together and get in the oven. My secret trick-use the bottom of a shot glass, lightly floured to make the indentation for the cheese mixture. I used a small scoop for the cheese mixture and done! Stir together cream cheese, powdered sugar and vanilla. Set aside. Remove crescent dough from packaging. Do not unroll. Using a sharp knife, cut the dough into 8 sections, about 3/4 inch thick. Place dough sections on a parchment lined or lightly greased baking sheet. 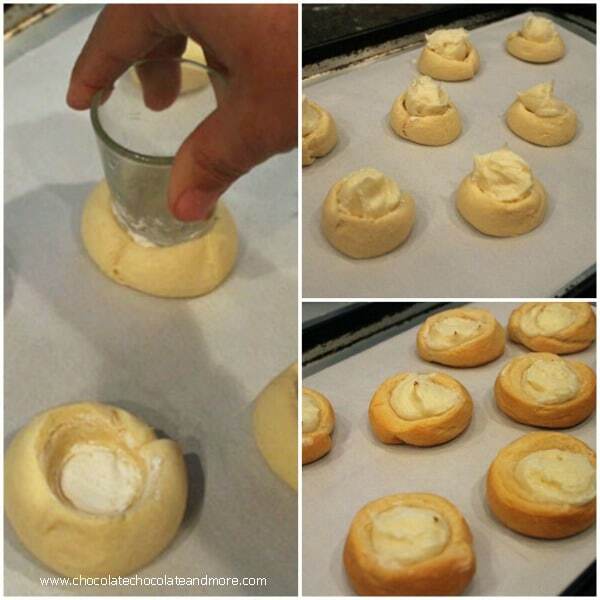 Create an indentation in the center of each dough section for your cream cheese mixture. I use the bottom of a shot glass, lightly floured. Place 1 rounded tablespoon of cream cheese mixture onto each dough section. A small cookie scoop works perfectly. Bake in a preheated 375 degree oven for 14-17 minutes, until dough is golden brown. While danishes are baking, create your icing. Combine powdered sugar and milk until completely smooth. Drizzle over warm danishes. Cassie didn’t want to share these with anyone! 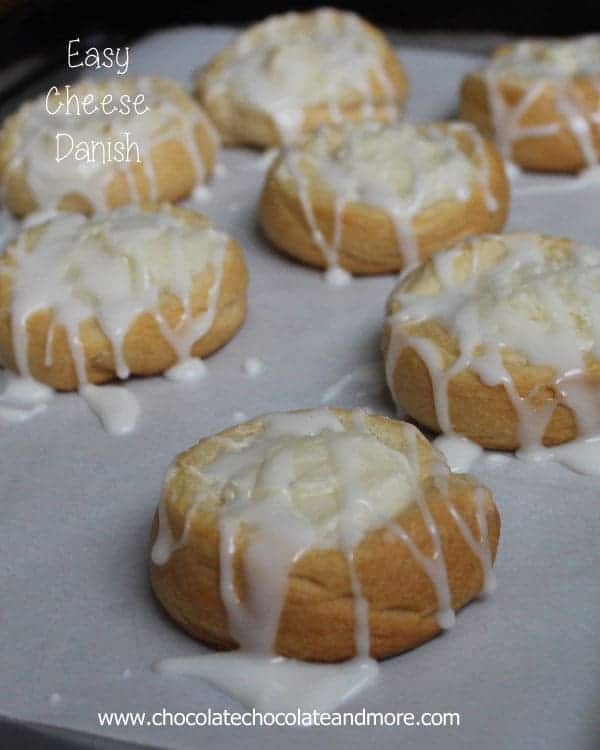 These look really good – I’m a sucker for cheese danish! You had to use “seamless dough” because this doesn’t look like crescant rolls. Do you have a recipe for seamless dough? 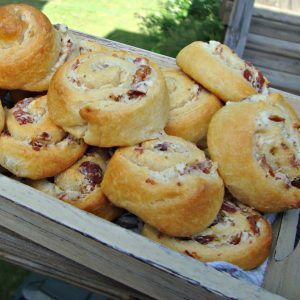 You can make this using the seamless dough, I have a hard time finding it around here so I just buy the rolls. For this recipe there is no difference in the outcome since you don’t unroll the dough. 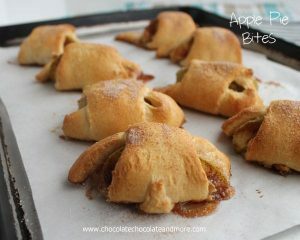 How tasty looking are these little beauties……and so simple to make! Who can’t resist a cheese Danish?! Not ME!! You had me at easy! This looks unreal! Love!! I love that these are made out of crescent rolls. Looking at the photos, I figured they would be complicated and I am not by any means a baker. Thank you for sharing at See Ya in the Gumbo. 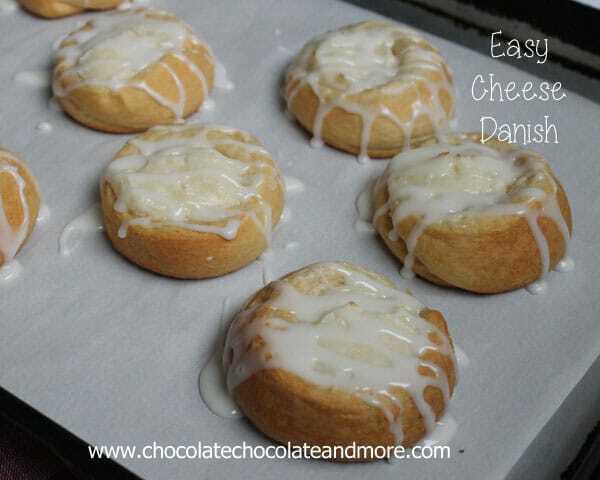 With these cheese danishes could you add fruit too, to make it a cherry cheese or blueberry cheese Danish? Absolutely! a fruit topping would be yummy! These look so good! And you can’t beat how easy they are to put together. Thanks for sharing! I make these using the Grands biscuits. They’re really good with pie filling too! 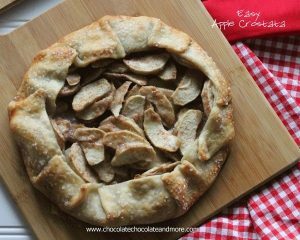 This recipe looked delicious so I decided to give them a try, they turned out wonderful! Super easy to make, I will definitely be making these again. I made these with Grand’s Biscuits because that’s what I already had at home. Turned out great! 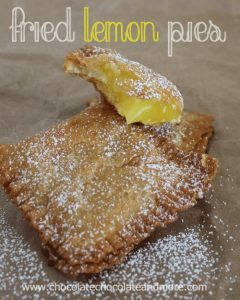 Indeed very easy and the cream cheese filling was yummy! 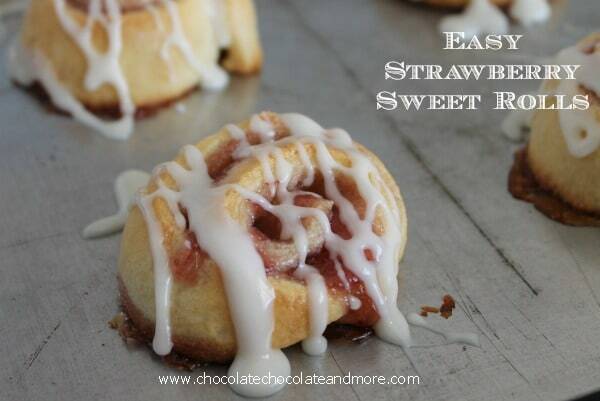 You can also use the filling piped in to cored-out strawberries – delish!